Twitter is a really great social service which allows you to curate a feed of nearly anything that interests you, whether it’s news, tech advice, recipes, pictures, jokes, celebrity updates, whatever. 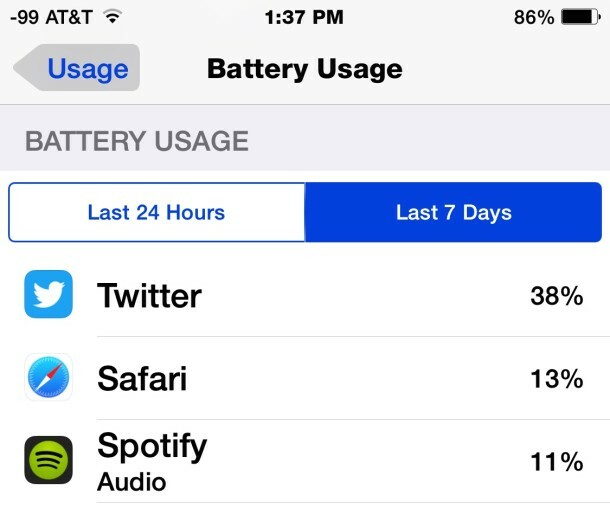 But the Twitter app for iPhone and iPad defaults to auto-playing video and animated gifs on both wi-fi and cellular data, this is entirely unwelcome for a variety of reasons we’ll touch on shortly, but it’s also annoying and can quickly lead to notable battery drain and excessive unnecessary cellular data usage. 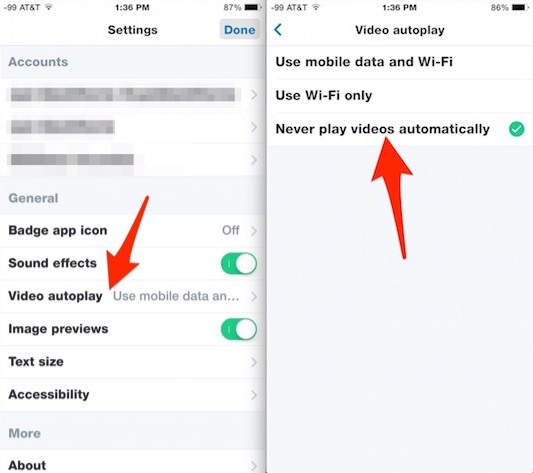 Fortunately, if you don’t want the auto-playing video on your iPhone or iPad, you can disable the automatic start of video and gifs in Twitter for iOS either entirely, or switch it to wi-fi only, either without too much effort. Obviously if you like videos automatically playing in your Twitter stream all the time, you wouldn’t want to make this adjustment. And of course, if you turn the feature off and decide you want it on later, just go back to the same settings option and make the adjustment as necessary. That’s all there is to it, you can now scroll through your Twitter stream without a bunch of videos playing themselves unsolicited, and without eating into your cellular bandwidth and battery as much. 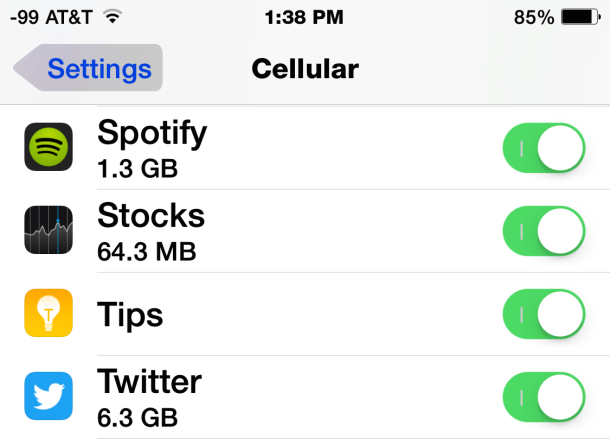 Note this has no effect on the ability to play videos you want to see in a Twitter stream. You can still play any video on Twitter, you just have to tap on it to load and start the video – probably as it should be. Why is auto-playing video bad on Twitter (or other social services)? 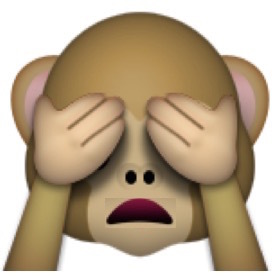 I’ll touch on a few obvious reasons why auto-playing video is bad on social media services. And to be fair, it’s not just Twitter, both Facebook and Instagram also now default to automatically playing video (you can turn it off in those too, links below). Not a great user experience, right? Well, that’s my opinion at least, so I recommend disabling auto-playing video on Twitter for iOS (at least for cellular networks if nothing else), and you may want to turn off auto-play video on Instagram and stop the same auto-play videos for Facebook app too, for the exact same reasons outlined above. Again, this is just opinion, you may like the autoplay video, if you do, great, keep it enabled and enjoy yourself. Between a reduction in battery life, an increase in cellular data usage, and the potential for seeing some really nasty stuff, it makes you wonder why auto-playing video is the default setting on all of these social apps to begin with. I turn off autoplay video with every app, Twitter, Facebook, Instagram, etc, on iPhone, and I do the same for every plugin on the desktop. Flash is the big culprit on web browsers, Google is making that automatic in the next Chrome version though which is nice. I agree 100% with your reasoning too, between the data usage and extreme content that sometimes slips through on news streams, I just don’t want to have unprompted video playing. Aside from those reasons, it’s also just flat out ANNOYING, on Instagram and Vine it’s basically a “listen to some teenagers choice in really bad music automatically in a low quality video, blasting out of a low quality 0.5mm speaker!” it sounds so bad, it’s a bad user experience.